The Raja Car Ferry is vital to the commercial life of Koh Phangan because it is the only boat which can handle trucks and cars. The Ferry goes back and forth between Thongsala and Donsak on the mainland from early in the morning to late afternoon. A boat leaves every 2 hours so if you miss your connection you aren't stranded for interminable hours in the port. The Raja Ferry is the best one to get after travelling all night on a train down from Bangkok. 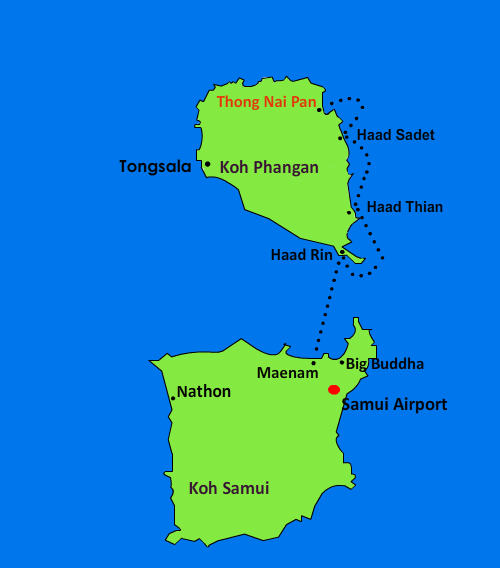 The Haad Rin Queen is the cheapest way to get between Koh Phangan and Koh Samui. Although much of its trade is taken up by the monthly invasion of Full Mooners from Koh Samui, the Haad Rin Queen is a really useful ferry for doing day trips to Koh Samui because Big Buddha pier is near Koh Samui Airport, Tesco Lotus, Big C Supermarket, Bangkok Hospital and trendy Bophut. This boat gets crowded and often there aren't enough seats. The last boat to Koh Phangan is 18.30. The Haad Rin Queen runs later than the other ferry services and so this last boat can be useful if you want to avoid having to spend a night on Koh Samui. For those wanting a really early start or don't fancy a night in Suratthani there is the Night Boat. 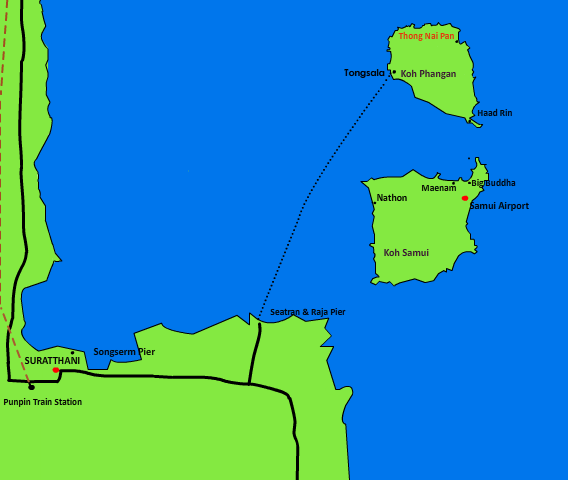 There's only 1 boat a night and it takes 7 hours to get between Koh Phangan and Suratthani on the mainland. The real value for this transport connection for tourists is that it allows travellers to get from Koh Phangan to Burma and back in one day so they can renew their visa. The new tourist visa regulations have, however, made the Myanmar 'visa run' a thing of the past for most people. Finally, there's the Thong Nai Pan Express, a small boat that sets off from Thong Nai Pan Noi and visits Thong Nai Pan Yai, Haad Thien, Than Sadet and Haad Rin before going on to Maenam in Koh Samui. 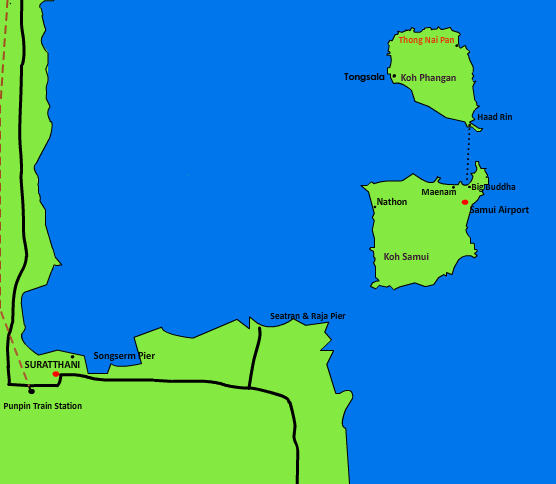 The journey from Thong Nai Pan to Koh Samui costs 300 THB. It is the only scheduled boat service to Thong Nai Pan. It is a small boat that goes into some small bays. Some stops you have to wade out to the boat, other times you are picked up by an even smaller boat. 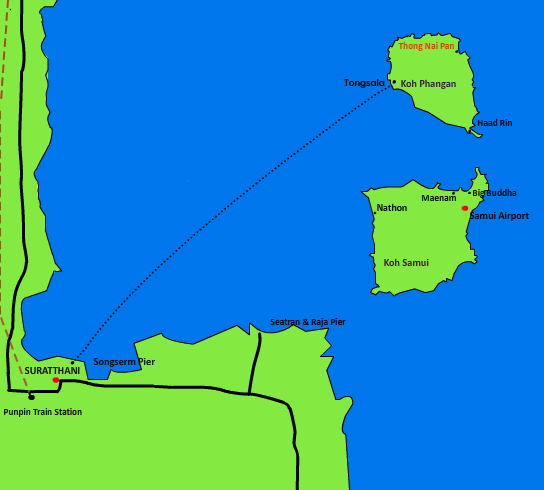 The Thong Nai Pan Express runs between January and October. There isn't a website or phone number you can use to contact the Thong Nai Pan Express so don't rely on it, if you have an important travel connection to make.